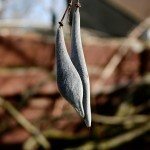 My 30-year-old Wisteria sinensis has died! Last year about a third of it died and I cut it away. It was very dark on the inside of the sawcut. This year the remainder started to grow but very slowly compared with other wisterias in my garden, then the growth stopped and died back. It is now completely dead looking and my intention is to cut it all down. What I would like to know is why it has died. It is on the south side of my house and completely covers the south- and east-facing walls. I have a 2-year-old layered plant from this, about 18 inches from the main root. Will this be okay, as it looks very healthy. Also, will it be neccessary to completely dig up the old root? There are a few root diseases that can do this, like cotton root rot or crown gall. I would dig up the root to see the condition of it. This will give you a better idea of what exactly the root disease that killed it was. The nearby plant may be in danger. I would keep a close eye on it and treat the area with a fungicide, which will help kill some of the possible causes of the older wisteria's death.